January 18th, 2011. Published in INTERVIEWS by Amanda Luginbill. At what age did you know you were an artist? What was the first work of art you created? I was five. At pre-school, everyday I use to spend the first two hours painting. It was by far the best hours of the days. We were given large sheets of paper and buckets of gouache paints. To this day, I still remember the scent of the paint and the joy I experienced creating those paintings. As a KiptonART Rising Winner, what do you hope will happen for you this year? I hope this year’s association with KiptonArt will bring forth an increase in visibility within the contemporary art scene, especially with New York as well as public awareness which is essential for the growth of my art career at this point. What is one of your favorite past exhibitions? About five years ago I saw an exhibition by the artist Jérôme Fortin at the Montreal Museum of Contemporary Art that completely transported me to another level of awareness. It was the most intelligent and beautiful art I had ever seen. I understood then the powerful impact an artist could have on a person’s life. I was standing in the middle of the museum, in complete awe, desiring more than anything else to create artworks that one day would transport people as much as I was at that moment. It was simply Divine. Who/what is your biggest influence or inspiration right now? Joan Mitchell for her strength and intelligence behind her paint strokes and Robert Raushenberg for his eternal creative youth. What is the first thing that comes to mind after an opening? Thank God it’s over! Lol I can sleep now! And after I let the magic happen. I know that amongst all these people that visited the show there is always one special encounter that I experience. A person with who I will forge a relationship. Someone always comes into my life to help me expand. Why do you work in this particular medium? This is a choice I made after spending eight years painting on canvas and using a brush. The day I took a camera in my hands and started documenting Nature, I felt an amazing sense of creative freedom. At the moment, I am enjoying this freedom of instant expression that the camera allows. I will continue to use this medium for as long as I have something to say with it. Somewhere within all of this, photography is also another stepping stone in the evolution of my art. I collect art and random images. They represent the structure of my own emotions, aspirations and probabilities of thoughts. Which of your own works on KiptonART are you favorite? Why? The ones that were channeled through me. I am in a constant meditative state when I create them. They just seem to appear right there in front of me effortlessly. They really do come from another dimension. A place not restricted by the boundaries of space and time. LeMay took a new turn in 2010 as she devotes herself full-time to the medium of photography. 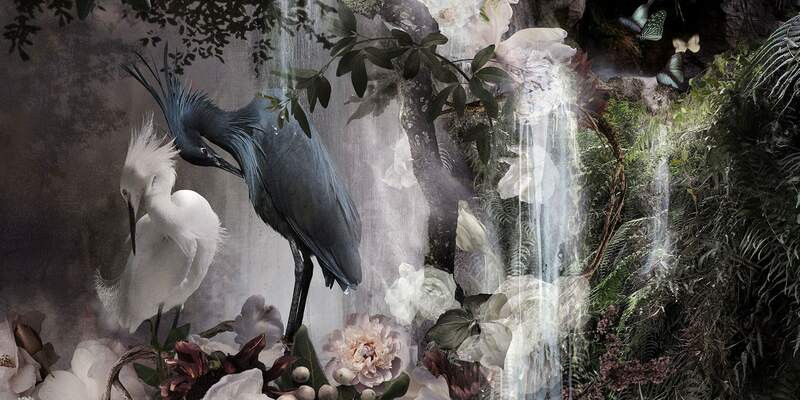 Combining her technical expertise with her deep-seeded roots as a painter, Ysabel LeMay continues her exploration into the power and divinity of nature through “Photo-Fusion”. This innovative technique is a lengthy process during which hundreds of photographs are taken, light and visual properties attuned and assembled one detail at a time in a painter-like fashion to form one large composition.